Home Beers 4 Mile Brewing Co.
Candy Bar Milk Stout | 4 Mile Brewing Co.
A- This pours with a genuinely nice looking dark brown/black-ish color and is certainly opaque in nature. The head is super creamy looking, dense and puffy, starting out about 2 1/2 fingers thick and settles rather fast, but doesn't disappear, but rather creates a protein filled thick layer on top of the brew.....lacing is modest with a lot of foam attempting to cling to the side of the glass, but alas, it slides that slippery slope back into the liquid.....carbonation is too hard to tell of course. A decent enough looking Stout from this new(?) brewery. S- Soft peanut butter tones right off the bat, with lactose sweetness. A well balanced blend of vanilla bean and dark chocolate perk my senses, with toffee cream infused coffee, mocha and/or cappuccino robustness. The finish lingers into a dry chocolaty malt forward astringency due to chocolate and or/black malts being used. Very little hop bitterness.....seems to have the right tones for a Milk Stout! T- Wow!.....this totally reminds me of a 3 Musketeers Bar in a glass! Malted milk, caramel/toffee, heavy cream milk richness, creme brulee custard, toasted peanuts, peanut butter sweetness, milk chocolate, nougat, slightly of sea salted caramel, smooth vanilla and a finish that is deliciously long and dessert like with just a hint of charred malt to help balance things out. Bliss on the palate! M/O- Velvety smooth I'm telling you! The carbonation reminds me of a Nitro Stout on Tap in terms of creaminess and the drinkability is very high....I would have no problems enjoying at minimum a full bottle of this on any given night. Would pair well with and chocolate based dessert and even could make a nice accompaniment to a beef gravy/stew! I am very impressed with this stout and will get again in the future....comes highly recommended! 650ml bottle - brewed with cacao nibs, peanut butter, vanilla beans, and sea salt (and some unspecified malt and hops too, I hope). This beer pours a pretty solid black, with the scantest of amber basal edges, and three fingers of puffy, finely foamy, and somewhat creamy brown head, which leaves a bit of low-lying streaky lace around the glass as it slowly but surely bleeds off. It smells of crunchy peanut butter, those little vanilla cookies, lightly roasted caramel malt, medium cocoa powder, faint cafe-au-lait, and some very, very subtle earthy, musty, and floral noble hop bitters. The taste is bready and doughy caramel malt, a lesser gooey toffee thing, bittersweet chocolate, fading vanilla cream, equally ethereal generic salted peanuts, and more well understated earthy, leafy, and floral green hoppiness. The carbonation is fairly mild in its milquetoast frothiness, the body a solid middleweight, and genuinely smooth, with a pleasant creaminess evolving as things warm up out of the ol' basement frigo. It finishes off-dry, the malt, cocoa, and vanilla most prominent in their lingering prowess. Overall - this is a fine milk stout, however, the attempt to replicate a Snickers or Reese's Peanut Butter Cup experience in a glass kind of falls flat. It's there in the aroma, but quickly disappears in the flavour stage. At any rate, a nicely quaffable offering, and if I want a candy bar, I'll just raid my pre-schooler's leftover Hallowe'en stash (yeah, he got a LOT of it last year). Tastes like a fake Christmas chocolate liquor with a bit of an ash tray after taste. Not a great example of the style. 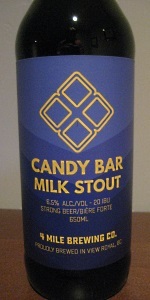 Candy Bar Milk Stout from 4 Mile Brewing Co.